By guest blogger Ben Herold. Cross-posted from Digital Education. The nation’s second-largest school district announced today that it has approved an “amicable settlement” with education publishing giant Pearson, to the tune of $6.45 million. The company’s payment is reimbursement for “content and services delivered under [its] technology partnership” with the Los Angeles Unified schools, according to a district statement. 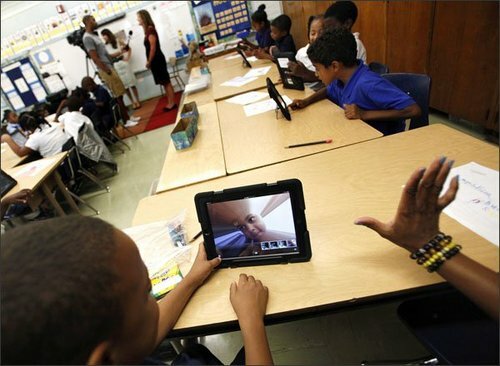 The agreement stems from a digital curriculum designed by Pearson that was to come pre-loaded on Apple iPads, which former Los Angeles superintendent John Deasy sought to provide to all students and staff in the 641,000-student district. In October 2013, Education Week first reported on problems with the curriculum, which was purchased and rolled out in schools despite being far from complete. The initiative also ran into a host of deployment problems, and the district’s procurement process is now the subject of an FBI investigation. The problems have led to a slew of high-level resignations and negative headlines, as well as critical reports from an independent evaluator. As a result, Superintendent Ramon C. Cortines is overseeing a significant scaling back of the program. The full text of the LAUSD’s statement is below. Today, the Los Angeles Unified School District approved an amicable agreement to accept $6.45 million in reimbursement from Pearson for the content and services delivered under their technology partnership. The parties believe that the agreement to reimburse the District is in the best interests of the students and stakeholders in Los Angeles. We appreciate the hard work of the District’s educators and staff, and the efforts of the Pearson team, to advance personalized learning in today’s high-tech world. Due to multiple factors, it became clear that this was not the right solution for LAUSD’s technology program at this time. However, we continue to work with Pearson in some areas.